Jacket and Pant conform to ANSI/ISEA 107 standard. Featuring waterproof, breathable, high-visibility design, Icon™ LTE Jacket and Pant incorporate premium 75 denier rip stop polyester to provide lightweight, comfortable durability. Outerwear can be wornÂ by itself in all climates or adaptedÂ for cold weather by adding fully compatible Icon interchangeable liners. Lime-yellow jacket is ANSI/ISEA 107 Class 3 and pant is Class E compliant. Level 2 reflective tape reflects light for 360Â° nighttime conspicuity. Piscataway, New Jersey, - Tingley Rubber Corporation, a leading supplier of protective footwear and clothing, has expanded its highly successful Icon™ line with the addition the Icon LTE jacket and pant. The Icon brand of outerwear conforms to the ANSI/ISEA 107 standard for waterproof, breathable, high visibility products. Fully compatible with Icon interchangeable liners, the Icon LTE incorporates a premium 75 denier rip stop polyester to provide lightweight, comfortable durability. The Icon LTE can be worn by itself in all climates or adapted for cold weather by adding any of the available liners. Engineered to provide superior comfort and safety in the toughest work environments, the Icon LTE offers premium design features. 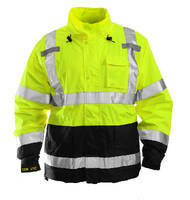 The lime-yellow jacket is ANSI/ISEA 107 Class 3 and the pant is Class E compliant. The fluorescent lime-yellow background material provides excellent daytime visibility while the level 2 reflective tape reflects light for 360° nighttime conspicuity. The Icon LTE is ideal for use in environments where waterproof, breathable, high visibility outerwear is desired for wearer safety and comfort. Tingley Rubber Corporation has been protecting generations of workers since 1896. Products are available from top distributors around the country. For more information please contact a Tingley Sales Representative or visit the Tingley website at www.tingleyrubber.com.